last month. I've made 3 or 4 visits in that time. My favorite room is the quarter room. Bingo Network. They have four rooms,all open 24/7, at 123Bingo Online. one additional method, also my preferred method. For my deposit, I used the playersrewardscard. 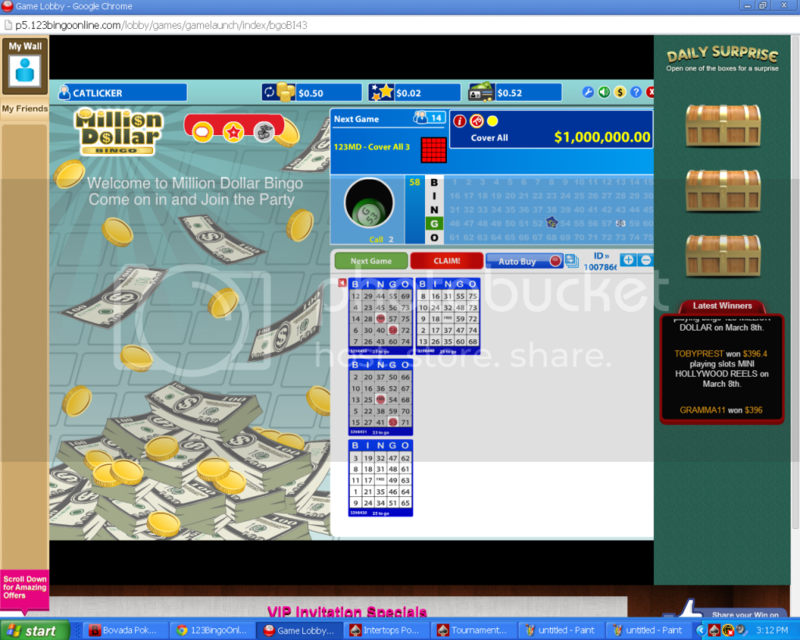 They generously offer Bingo Bucks in chat, in every bingo game played !!! to cash out, the bonus money will be removed from the total withdrawal amount. Customers may win BBs (Bonus Bucks) by participating in chat games or as a result of certain promotions. Customers may receive a maximum of (3) three times the sum total of all deposits they have made within the last 10 days in BBs. In order to be credited with BBs a customer must have made a real-money deposit within the previous 10 days. If awarded as part of a chat game, the customer must have played at least 3 bingo cards. Customers with pending withdrawals or pending pre-pre-purchased bingo cards do not qualify to receive BBs. Customers need to have a deposit made within the last 60 days to make a withdrawal request. from our network websites. Withdrawals are processed daily, Monday through Friday, and will be approved or denied within 4 business days. Approved withdrawals are then sent for payment within the next 10-14 business days. a processing fee of up to $40, depending on the payment processor and/or withdrawal amount. A $25 NO DEPOSIT BONUS for new sign-ups is available by clicking on the attached banner. of the no deposit bonus. 1st DEPOSIT BONUS is an astounding 300% and it is in your account instantly. 123Bingo Online is not VIP enabled. USA Players are allowed at 123Bingo Online. The complete list of Countries allowed/disallowed is available on their website. This list is quite lengthy and too large to include in this writing. LiveChat is available 24/7 and there is no waiting time. The LiveChat personnel were pleasant and extremely helpful. Support number to use. To date, I've had no issues that require Customer Service. games and also the casino games, the conditions for withdrawing funds are, in my opinion, unreasonable. are full of legalese and a very long read. That, in itself, is enough reason to just move on down the road. There are probably hundreds of other Bingo sites that deserve a visit. Bonuses listed in this review may have changed since the posting of this review and are shown only for information for this particular players personal experierence.